Do you like warm chocolate chip cookies? I've decided this question is my new personal gom jabbar*. Because really, what sort of a person doesn't like warm chocolate chip cookies? I attended a private elementary school. I have few distinct memories from my years there, but one of them is of being one of the last two people standing during a spelling bee, and losing on the word helicoptor helicopter. Another is of going through the lunch line and claiming a plate with a steaming hot chocolate chip cookie. 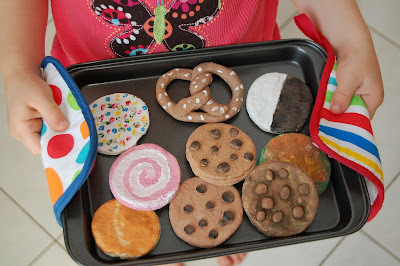 Those cookies were soft and gooey, just barely cooked in the middle, big enough to fill the plate and even hang over the edge a little, and cost 85 cents. Typically you'd go through the line once, get your lunch, and sit down to eat it, rising and going through the line a second time when everyone else had been served lunch to get dessert. Then your classmates would watch with envy while you paid and returned to your seat to enjoy the lunch room's single greatest pleasure. I made two desserts for Father's Day this past weekend: a strawberry rhubarb pie and this deep dish skillet cookie. I saw the cookie recipe at the amazing Sugarcrafter blog just last week, and knew that I'd have to make it happen in my kitchen soon. 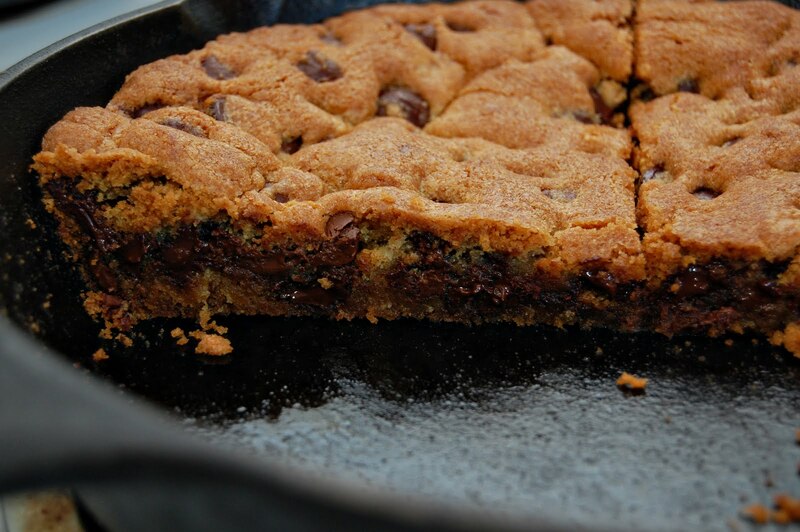 Baking a cookie in a cast iron skillet is pretty much genius if anything is. Topped with vanilla ice cream and fresh from the oven, I enjoyed it as least as much as those lunch room cookies, which I'm sure sentimental memory has elevated the excellence of, and I didn't have to wear an awful plaid uniform to get it. I made the cookie dough the night before which made this an easy entertaining dessert. Just give the refrigerated dough a half hour or so to come to room temperature before attempting to press it into the pan. Gradually mix in the flour mixture until well combined. Stir in 1 3/4 c. chocolate chips (or less...I used something like 1/2 c. bittersweet chips and 3/4 c. milk chocolate chips and it seemed like plenty). 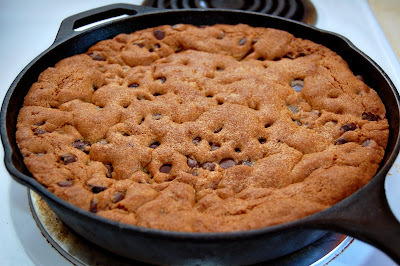 Press cookie dough evenly into a greased 10" cast iron skillet and bake for 35-45 minutes until golden brown. Allow to cool for 20 minutes or so, and serve in wedges with vanilla ice cream or a tall glass of milk. *This is the single geekiest reference I have ever made in a blog post. Hubby and I just finished listening to an audio recording of Dune and it couldn't be helped. I'll try to resist the temptation to refer to cinnamon as melange from now on. This looks so yummy! I have made them in cake pan before, but the deep dish part of this sounds so yummy! Thanks for the recipe. I'd love to have you link up to my Share the Wealth Wednesday Link Party at www.laughloveandcraft.com. I'm your newest follower. mmmmmm. :) I want one. I love Chocolate Chip Cookies! I'm your Newest follower :) I hope you'll come check out my site and follow me as well. How cool! I made a giant cookie for Father's day too and wrote #1 Dad on it with icing. Since the Dad around here isn't fond of cake -- the giant cookie is used for his birthday too! Love soft, gooey cookies 1/2 baked! Oh. My. Word. Help! What a marriage--cast iron meets chocolate chip cookie! Oh yum!! My hubs and I used to get one of these at our favorite restaurant back home, but since we moved to TN, we can't find it anywhere :( Looks delicious! Looks so delicious...yum! You actually had me at chocolate! I saw this on Sugar Crafter and I have been wanting to make it. Warm chocolate chip cookie and cold vanilla ice cream, yum.